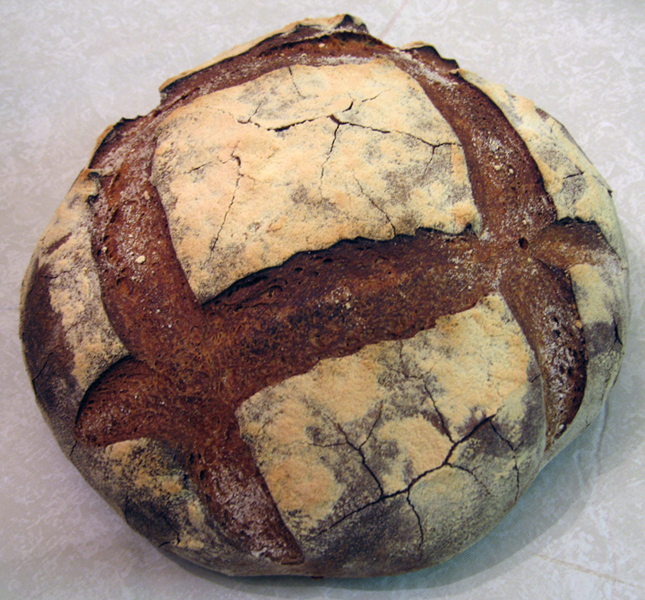 Here is one of many loafs I have made following Peter Reinhart's instructions for the Poilâine-Style Miche in his book Bread Baker's Apprentice. I really just wanted to make this blog entry to share some of my pictures of this loaf. I have been making a Poilâine loaf every weekend for the past couple of months and I continue to tweak everything, especially the flour types/brands, blends, and siftings. Depending on these factors, especially the flour, the hydration also gets tweaked. I love making these loafs and I have never made one that wasn't delicious and eaten within a week but I continue to chase Poilâine nirvana. As we all know, as for the real Poilâne loaf, the key is in the proprietary French T80 flour he uses. This odd gray flour, most likely, can't be replicated BUT it is possible to make a loaf at home that is as good, if not better than his loaf! 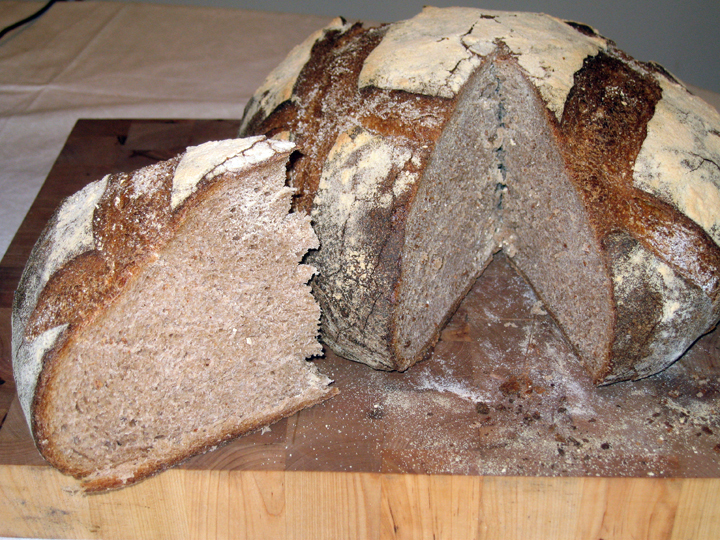 In this loaf's rendition I used 100% Bob's Red Mill Whole Wheat Flour which I double sifted to remove some of the bran. This flour is stone ground from hard red U.S. dark northern spring wheat and has all of the bran and germ still intact. This flour is an over the counter flour in my area and the grind is somewhat finer than the local organic, freshly ground, whole wheat flour that I have been recently using...that is a whole other blog entry. So, it is not as easy to remove this finer bran. If I used this flour again I would sift it some more to try to remove a little more of the bran. I love how this loaf came out. 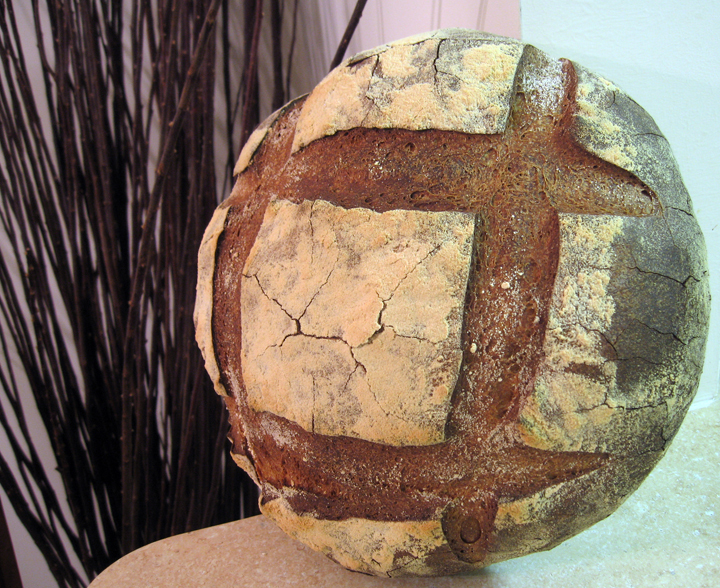 The loaf sang like a woodpecker when it came out of the oven creating a beautiful crackly crust as it cooled. The aroma was amazing, a rich caramelized wheaty aroma that reminded me of a bowl of hot grape-nuts cereal...I know, I'm crazy. The crumb was tight, yet light, moist, and springy. I was pleasantly surprised by the awesome flavor, the crumb had a distinctive wheaty and lightly sour taste and the crust had a deep caramel flavor with a fantastically sour bite. After I cut into it I kept it in a brown paper bag and it stayed fresh, except for the drying of the exposed cutting areas, and totally edible for an entire week. I currently have daily access to actual Poilâine loafs here in New York City from Agata & Valentina so I am aware of what it looks and tastse like and this loaf is quite different, haha.